Yeah, yeah, Dragonborn DLC for Skyrim has a trailer, you can ride dragons and it looks like some of it takes place in Morrowind or an area a lot like it, whatever. I want to talk about this promotional art instead. And I think you can guess what I want to talk about, although I’m going to try not to trip your work’s profanity filter while doing it. Look, I get it when more staid companies do this. They’re not on the Internet all the time. They don’t have dirty minds like the rest of us. But Bethesda is a video game company. They’re on the Internet all the time. It’s practically their job to look at this stuff and find this. So, how did this promotional art get by everybody in the marketing department with nobody noticing the helmet had a… how do I put this? …a mouth that looks like the same thing everybody sees in Georgia O’Keeffe paintings? Bethesda not only tweeted this out, they made it into a high resolution wallpaper. Seriously, how did they not notice this? I showed this to my fiancee yesterday and the first thing she asked was why that helmet had a ladypart made out of blades. It’s all there, anatomically speaking. Unless I’ve really missed something about dragon reproduction in the Elder Scrolls universe, it seems pretty safe to say that this is intentional. Really, what’s that for? What’s the combat efficacy of chin blades, bar your being Bruce Campbell? I have to say, this has achieved the necessary result. I really want to see Dragonborn now. Just not for the reasons Bethesda was hoping. 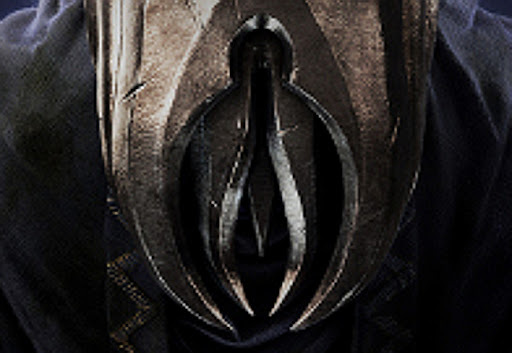 The post Bethesda’s Dragonborn Armor Clearly Designed By Georgia O’Keeffe appeared first on UPROXX.